From 9 to 18 November 2016, a multinational executive management seminar for the physical security and stockpile management (PSSM) of small arms and light weapons (SALW) was conducted in Berlin and Geilenkirchen, Germany. Targeting senior government representatives from the Sahel region, the course was organized by BICC in co-operation with the Verification Center of the German Armed Forces (ZVBw). The Sahel zone has become a hotspot for the proliferation of weapons—often originally from government stocks looted after the fall of the Qaddafi regime in Libya. Arms and ammunition traced back to that source have been found in a wide arc of conflict-affected countries from Nigeria in the west of the continent all the way to Somalia and Yemen. Contributing to civil war, acts of terrorism and organized crime, the diversion of government-owned weapons is a major threat to human security in the region. One of the main objectives of this workshop was to discuss international standards concerning small arms control, such as the International Small Arms Control Standards (ISACS) and to set those into the local contexts. Emphasis was on the needs of the participants while establishing steps towards achieving these standards. Another major objective of the workshop was to discover the manifold ways of how to better co-ordinate and finance PSSM initiatives in the Greater Sahel and to help establishing a platform of dialogue between the different actors in this vast field. The workshop served as a step in increasing co-ordination and co-operation in this field. The second part of the course, which was taught at the Verification Center of the German Armed Forces in Geilenkirchen dealt with the technical aspects of improving physical security and stockpile management. It gave the participants insights into how to assess and to prevent risks (such as intrusion or unintended explosions), how to mark and register weapons and how to conduct self-assessments. The course also included practical exercises and a guided visit to an ammunition depot of the German Armed Forces. Conducting the course in Germany gave the opportunity for direct exchange between high-level representatives from the participating African states and donors or implementing agencies on the local realities and needs in the fields of small arms control and PSSM. 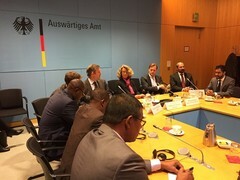 The workshop was funded by the German Federal Foreign Office as part of the project Physical Security and Stockpile Management (PSSM) Capacity Development and Technical Advice in the Sahel and the Horn of Africa and the sister project Physical Security and Stockpile Management (PSSM) Capacity Development and Technical Advice in West Africa.